The Soul Catcher is a great Hookah for a budget minded or first time Hookah smoker. 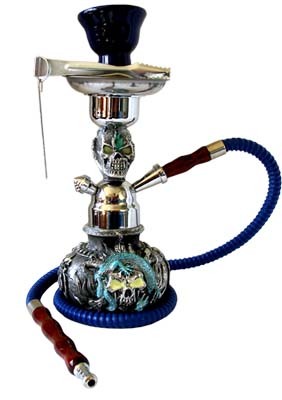 The Soul Catcher features a skull shape stem which adds to the overall spooky and Gothic design of the Hookah. This Hookah is ideal for traveling due to its overall size and even glows in the dark to enhance your smoking experience. This Hookah may be used for both decorative and smoking pleasures, providing entertainment for years to come. The Soul Catcher may be converted to a two hose Hookah by utilizing stem adapters that contain the auto-seal system. The Auto Seal system eliminates the need to use rubber stoppers and flip caps when there are multiple users smoking the Hookah. This Hookah may be used for both decorative and smoking pleasures, providing entertainment for years to come. Product Use Disclaimer Please note that each vase is unique and therefore the skull pattern on the vase may vary from the above picture.